I was so excited because it seemed that Ruth Reichl and I were on the same wavelength again. But then my sister asked if I thought it might have something do with us both using seasonal ingredients. Way to burst my bubble! I guess that's exactly why we, coincidentally, had four peaches on hand just when Ruth posted a recipe for peach cobbler using four peaches. I was so pleased with the way Ruth's simple recipe for blueberry muffins turned out that I immediately convinced my mom and sister that we needed to make her peach cobbler for dessert on Sunday evening. I sliced peaches (but did not peel them as the recipe directed -- no need for that) and stirred them up with some sugar, lemon juice, and cornstarch. My mom mixed together the cobbler topping. Ruth's recipe says to plop the dough onto the peaches, but our topping was more crumbly than "ploppable." We just went with it. Then we were supposed to sprinkle sugar on top. I just so happened to have some raspberry cane sugar that my mom had brought me back from her recent trip to California. I thought the raspberry sugar would pair well with the peaches and sprinkled that right on top. We baked the cobbler for half an hour, until the peaches were hot and bubbly and the topping was lightly browned. The cobbler came out as more of a cross between a cobbler and a crisp, but we all loved it with a scoop of ice cream. Even Jeff, who'd rather have apples than peaches in a dish of this sort, gave it a try. It was warm and comforting and really showcased the ripe peaches. And the topping was both crunchy and soft. It was perfect with a scoop of vanilla ice cream. 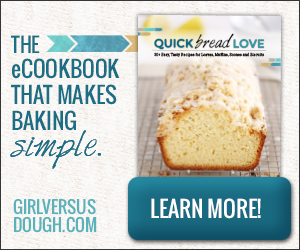 For the complete recipe, see Ruth Reichl's blog. What have you made with peaches recently? What's your favorite peach dish? I finished my bittersweet last day at Flour, trekked home, showered, packed, and headed down to the Cape with Jeff and Gunner. We were meeting my mom and sister at the house my mom rented for the off-season in East Falmouth. The house actually belongs to my aunt and uncle who live in it during the summer but then head back down to Florida for the rest of the year. We usually stay in Eastham for a week or two in the summer and over Columbus Day weekend, so this was an area of the Cape I hadn't spent too much time in yet. We didn't do too much exploring this trip because I was really in the mood for a laidback, low-key trip, but I have plenty of time between now and June to see what else is around. And I'm hoping to take the ferry over to Nantucket one weekend too -- I've never been there before. We got in late on Friday evening, and my mom and sister had a spread of crackers, cheese, tomatoes, basil, oil, hummus, and bread waiting for us. Upon seeing the cheeses my mom had set out, I immediately dug into the Double-Cream Cremont from Vermont Butter & Cheese Creamery. I had been dying to try this cheese for a while and hadn't found it at any of the stores I go to regularly. My mom ended up finding it at Bean and Cod in Falmouth. It reminded me of St. Andre triple cream cheese, one of my favorites. I really hope I can find Cremont around here soon. After we snacked for a bit, we attempted to throw some lamb chops on the grill. We went out on the dimly lit patio, fiddled with the grill until we got it lit, and soon discovered that it would be hours before our tiny lamb chops would be cooked through. We brought them inside, and my mom broiled them instead. And we decided to figure out what was wrong with the grill the next day when we'd have some light to take a better look. We enjoyed the lamb chops with roasted red potatoes and broccoli. 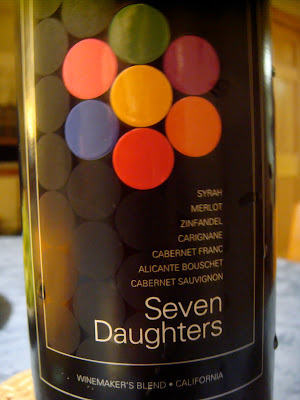 We also tried one of the wines I picked up along the way: Seven Daughters, a combination of 7 different wines. It was okay but not one of my favorites. I picked our wines for the weekend based on label design. It may not have been the best idea. The next day began with a whimpering puppy staring out the window at the lake outside, hoping we would realize how badly he wanted to go for a swim and drag ourselves out of bed. It was 6 a.m. That was not happening. We managed to sleep for about another hour and then caved in. After breakfast and some Starbucks, we were all looking for a little ocean and made the drive to Marconi Beach in Wellfleet. Jeff and I are kind of antsy beachgoers, so while my mom and sister entertained themselves for hours with a game of Scrabble, we strolled up and down the beach. We even glimpsed a seal swimming around and popping its head up out of the water here and there. A day in the sun was just what I needed. On the way back home we stopped for some new ceramic briquettes for the grill, what we hoped would solve the problem we encountered the previous night because we had some big plans for grilled veggies and filet mignon. After visiting Emack & Bolio's in Orleans for a pre-dinner ice cream, we got back home and let Gunner go for another swim. My mom scooped out the old briquettes and poured in the new ones and tried lighting the grill. Strong heat and flames emanated from the grill. We were good to go! I was excited to use the new grill basket we got at Williams-Sonoma, so I began chopping veggies and filling the basket. We had red and green peppers, squash, zucchini, and onions. I added a few fresh basil leaves, salt and pepper, onion powder, garlic powder, and some olive oil, and shook everything up. I set the veggies on the grill, and besides shaking them around here and there, cooking them was pretty hands-off. When they looked close to ready, we added in some tomatoes, and the leftover broccoli from Friday night's dinner. My mom grilled up the filets, leftover red potatoes (but we also had some Russets baking in the oven), and mushrooms to accompany the steaks. We tried another new wine called next. I definitely picked this one because of the bottle. When I first looked at it, I thought someone had written notes all over it. Upon further inspection, I realized that was part of the label. The wine was okay, not much more exciting than a white table wine, but the poem on the back was inspiring. We all sat down to a perfect grilled dinner together. It was exactly what I wanted and what I rarely get to have... a meal hot of the grill, eaten outside and in good company. After dinner, we gathered around the campfire my little sister started and made s'mores and shared stories. Sunday was a good day for us to hang out by the lake and take a short trip into Falmouth Center because Jeff had to head back toward home for a 4:30 softball game (is that dedication or what?). The boys went swimming while I sat on the deck and got some sun. While Jeff was at his game, my mom and sister and I did a little exploring and got pedicures! We also stopped to pick up fish for dinner and corn from a local farm stand. When we got back, I let Gunner swim again for a little bit (he could seriously spend all day in the water if we let him), and Jeff returned soon after (with a 23-0 victory). Meanwhile, my sister roasted the corn in the oven. She just put it in there at 350 for 40 minutes and rotated it after 20 minutes. I'd never cooked it this way before but loved how it came out. With the corn ready my mom prepared the fish, and I gave her our new fish grill pan from Williams-Sonoma (yes, I'm obsessed) to try out. It's pretty fancy with extra-fine mesh to hold and protect the delicate fish. We had yet another wonderful meal. This time we sat inside though because it was a little too buggy outside. My mom and I made peach cobbler for dessert, but I'll tell you about it in an upcoming post. I know this one is pretty long already. Yesterday was our last day on the Cape, and we decided to try a beach in Dennis called Mayflower Beach. It was absolutely gorgeous. When we got back to the house, Jeff let Gunner get one last swim in while I packed and cleaned. When my mom and sister got back, we all went into Wood's Hole and had dinner at the Fishmonger. Jeff had another softball game last night, so we had to rush through dinner a little and hit the road, but I was glad I got to enjoy one last waterside meal before we left. We were all sad to leave vacationland, but it was time to get back to the real world. Even for this guy. I still have the rest of today to recharge a bit and do some stuff around the house before it's back to work. At least there are just three days left in the week and then there's a three-day weekend! Did you do anything fun this past weekend? Any big plans for Labor Day weekend? One year ago I had no professional baking experience. 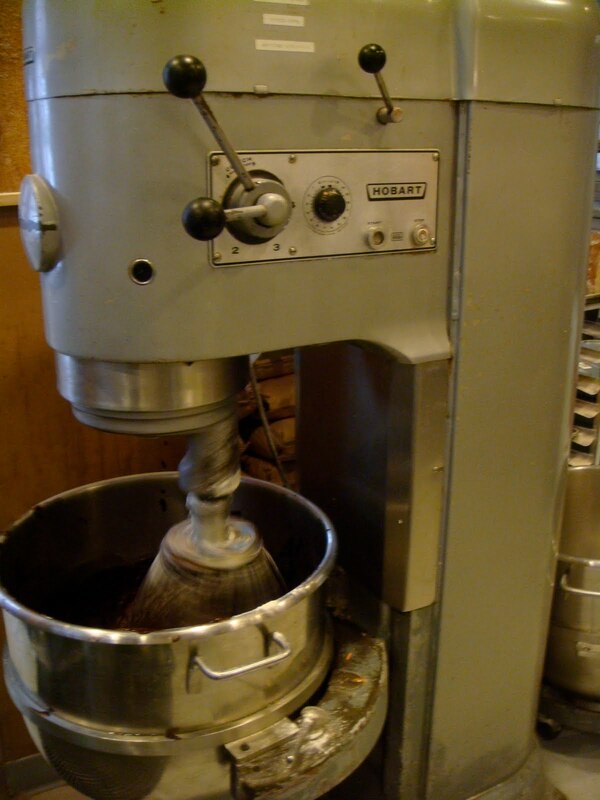 All of that changed when I came across a job posting for a baker at Flour Bakery + Cafe. I went out on a limb, applied, interviewed, trailed, and got the position. I worked part time for seven months and then full time for six more. After today, I leave the bakery and go back to my editing job full time again. I loved everything I did at the bakery and the people I worked with. I enjoyed the experience, and I'm sad to be leaving. But sometimes we have to be practical. While I could handle all the work, it's the schedule that really did me in. The 4:50 a.m. alarm waking me up; the six-day work week (four 10-hour days at Flour and two 8-hour days at my editing job -- and that's only after I cut back my hours in July; and the missing out on family gatherings, holidays, nights out with friends, and time with Jeff all started to add up. I realized I couldn't keep up the lifestyle I had been living, and I made the decision to go back to the office job -- with the weekends and holidays and vacation time and decent pay. I'm so sorry to disappoint all of you. I know how excited you were when you found out I took the leap into the baking world, partially leaving the routine and security of a desk job and finally doing something I really loved -- something that didn't feel like work at all. I know it's the safe choice, but I don't think I'll regret it. I got to spend a whole year baking and learning about working in a bakery. I'm not entirely sure what I want to do in the future, but I hope I can incorporate some of what I learned. I still cling to my dreams of getting boatloads of freelance cookbook copyediting work someday. (I have so much time for freelance work now!) In the meantime, I plan to continue to hone and sharpen my editing skills professionally, work on my baking as a hobby, and put so much more effort into this blog. But before I leave the bakery behind, I thought I'd share all the things I'll miss and those I won't. I won't miss walking to work in the early morning hours alone, but I will miss how still and calm everything seems at the time. I won't miss taking the T on a regular basis and listening to drunken bums' loud monologues in the early morning hours. I also won't miss standing on the T on the way home after I've just been on my feet for 10 hours. I will miss seeing the sun come up over the channel as I'm walking the last couple of blocks to work. I have seen some gorgeous sunrises. And I'll miss seeing the bridge all lit up on dark or rainy mornings. I will miss smelling the bread baking as I round the corner to the bakery. I won't miss wearing a goofy chef's coat -- not because they're goofy by nature but because they're all way too big on me, as well as the apron that hangs shapelessly from my neck. And I definitely won't miss wearing a hat. I'm so not a hat person! Bandannas always slip right off my head, so a hat was my only option. I'm not showing you a picture of how ridiculous I look. Okay, maybe just one. I will miss looking at the clock around 9 a.m. and realizing that I've already put in 3 hours of hard work. I'll miss torching the creme brulees. 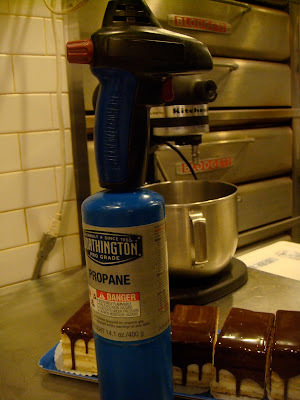 I'll miss the propane torch -- although I did ask for one for my birthday (hint, hint), but I also asked to have dinner at Craigie on Main or attend one of the Apple Street Farm dinners L'Espalier does, so we'll see what happens there. The dinners are really expensive, so I'd be happy with the torch! I'll miss glazing the individual triple chocolate mousse cakes. I'll miss finishing and decorating the individual lemon raspberry cakes. I'll miss making fruit tarts, and when I make fruit tarts at home now, I'll never, ever glaze them with jam. They look gorgeous without it. I'll miss making all of the tartlets. You know how I love mini things. I'll miss finishing the Boston cream pie. It takes a lot of practice to get these perfect dribbles down the sides. The ganache has to be just the right temperature, and you have to pour just the right amount. Some days it worked out perfectly; other days it would be completely coated with chocolate -- not necessarily a bad thing. I'll miss decorating and writing on all of our cakes. I was finally getting pretty decent at writing. And I make the best paper cones now. I keep thinking about making a video on how to craft these paper writing bags because I think written instructions and pictures make it seem so much more difficult than it is. I will miss making hundreds and hundreds of sticky buns. I don't know why, but sticky buns make people happy. And I like that. I'll miss making rounds and rounds of tarts and tartlets. I could probably spend an entire day doing that and not get bored. Some of my favorite shifts have been what we dub "sheeter shifts," where I just do sheeter project after sheeter project. I'll definitely miss the sheeter. I wish I had one at home. It would make quick work of most projects I reserve for my rolling pin. And who doesn't want one of these at home? I'll miss making interesting desserts for Myers + Chang, like these five-spice meringues or marshmallows and fortune cookies. I'll miss the snack tray -- where broken pastries wait to be snatched up by hungry, sugar-craving Flour employees. Speaking of the sugar cravings, I've already realized that when I'm sitting at the office, I suddenly need a piece of chocolate or a brownie or a cookie at random times throughout the day. This could be a problem. I'll really miss Sundays. For 3 hours of my 10-hour shift, the bakery is closed. It's really nice to just bond with the rest of bakers and work steadily in the back without some of the daily hustle-bustle out front. There are also doughnuts on Sundays, and whenever we have a new flavor and an oddly shaped doughnut, we split it and weigh in on what we think of it. The milk chocolate hazelnut doughnuts, garnished with candied hazelnuts, were my favorite. To those who know know what I'm talking about, I will always remember that Sunday IS funday. Most of all, I will miss everyone I worked with. I had the opportunity to work at all three Flour locations, and I learned so much from the chefs, pastry chefs, head bakers, bakers, and pastry cooks at each location, not to mention from Joanne, herself. And I know I made some lifelong friends. Thank you all for everything you taught me, for making me part of the Flour family, and for keeping me smiling every day! What do you dream of doing? What have you already accomplished? I'm heading to the Cape tonight to recharge and regroup. I'll tell you all about it when I get back. I hope you have a fabulous weekend!